Liam in Loopy, our soft wool boucle - featuring a snuggly warm earflap hat! Sweater sets are wonderful winter companions! A complete fashion statement, but they also help keep a kid covered and warm, whether they notice the cold or not! Our sweater sets are special. Why? We make each and every sweater and hat by hand, one at a time, and ship them straight to you. These are not mass-produced, or 'hand-made' on a machine loom. 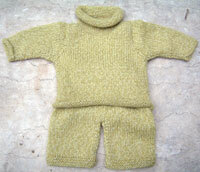 Each fabsweater set is handknit, one at a time, and shipped directly to you. Gift wrap is available, complete with a custom card. Most of our sweaters are in stock and ship within 1-3 days- we often sell out, but are constantly searching for unique fibers to showcase with our funky styles! 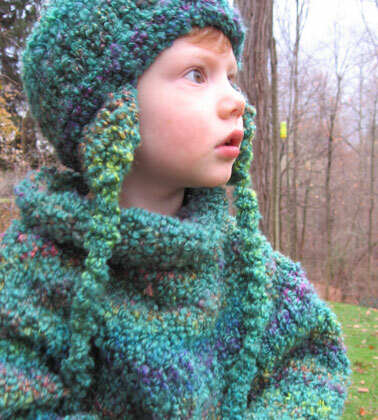 Order one of our Gorgeous handknits and see what a difference a handknit sweater can make - you might even get your kids to keep their sweaters on. 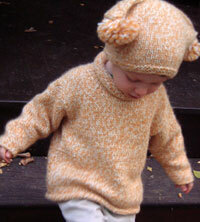 Children love our funky sweaters, and toddlers look adorable. Our sweaters are not mass produced, and are made with love. BabyShopsOnline.com - Whether you're looking for a gift for the new mom and baby, maternity clothes, furnishings for the nursery, or the perfect outfit to bring your new baby home in, you'll find it all here .... and plenty more!